About three years ago I mixed up a color and I fell head over heels in love with it. It’s been my forever color crush since that day. 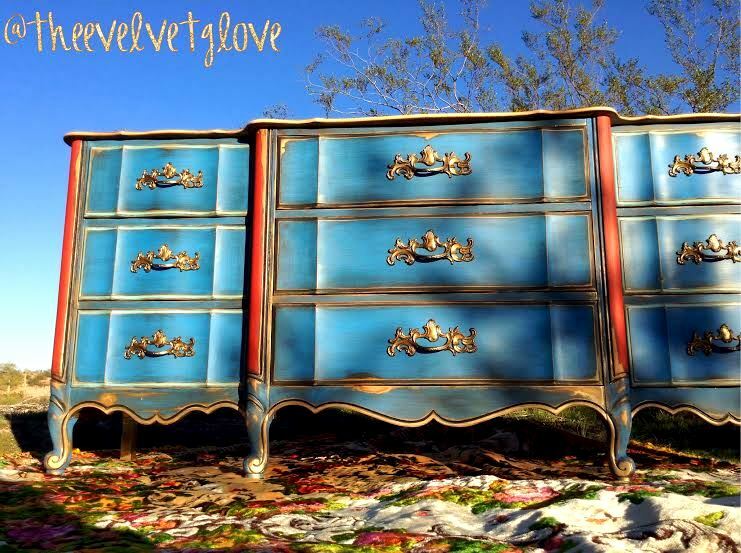 I named it “Graceland Blue” because it reminded me of the blue velvet curtains trimmed with gold fringe (God Bless America and God Bless Fringe.) that hang in the dining and living rooms in Elvis Presley’s Graceland in Memphis, Tennessee. 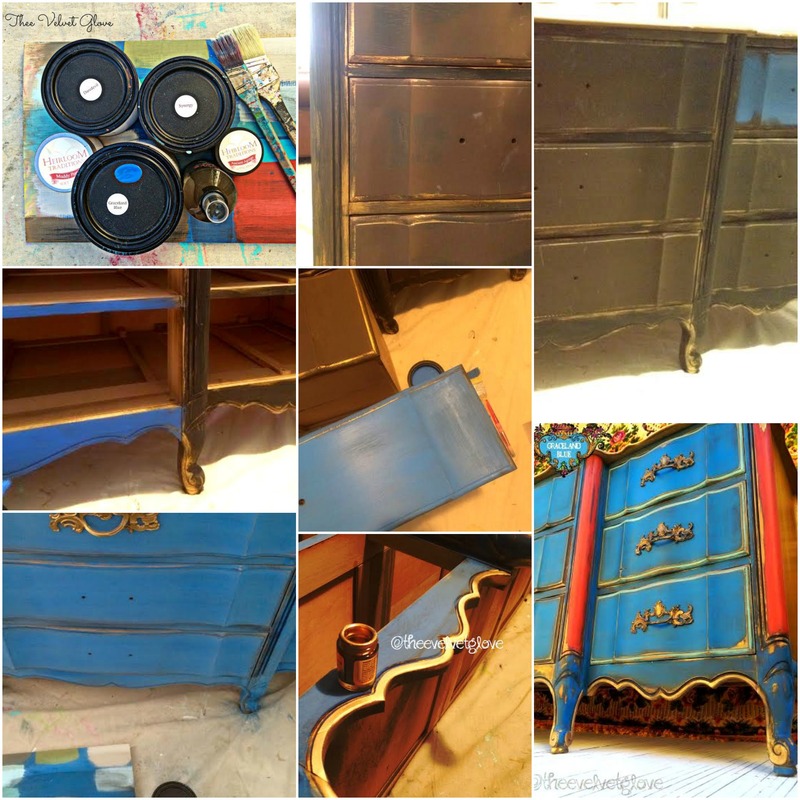 I painted a pair of nightstands in that blue and listed them on Etsy and had seller’s remorse when they sold. It’s a sad thing to get attached to furniture but I’ve been there a few times. I’ve wanted to run down the street chasing my carrier’s truck more times than I’d like to admit. 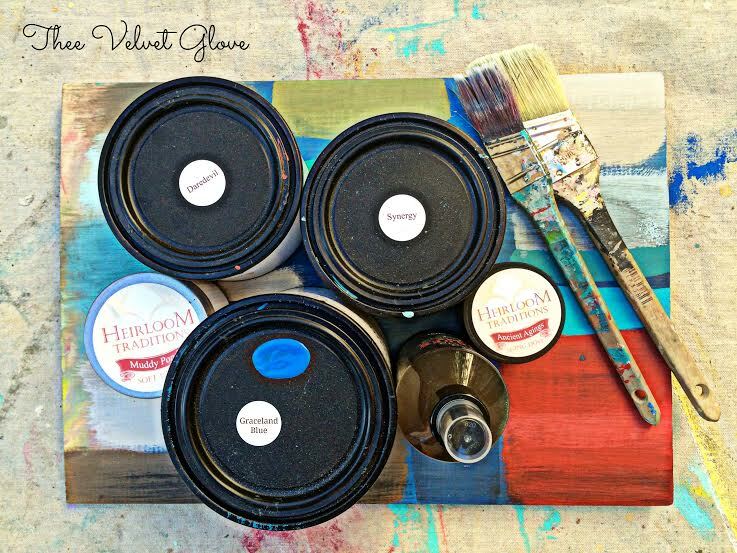 I sent Paula Blankenship, Creative Director for Heirloom Traditions Paint a swatch of the color and she matched it perfect and mixed it up for me. YAY!! I’ve been asked for this color quite a few times in the last three years. 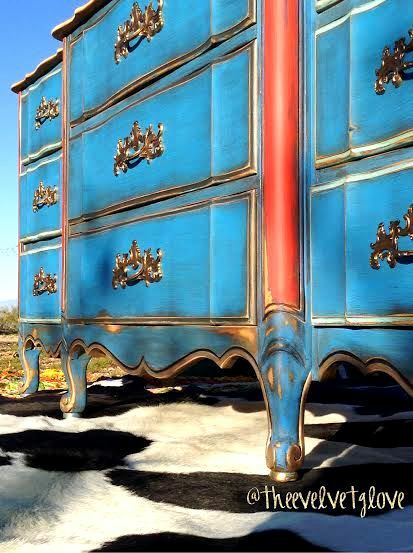 You can now purchase my signature color, Graceland Blue on Heirloom Traditions website here. 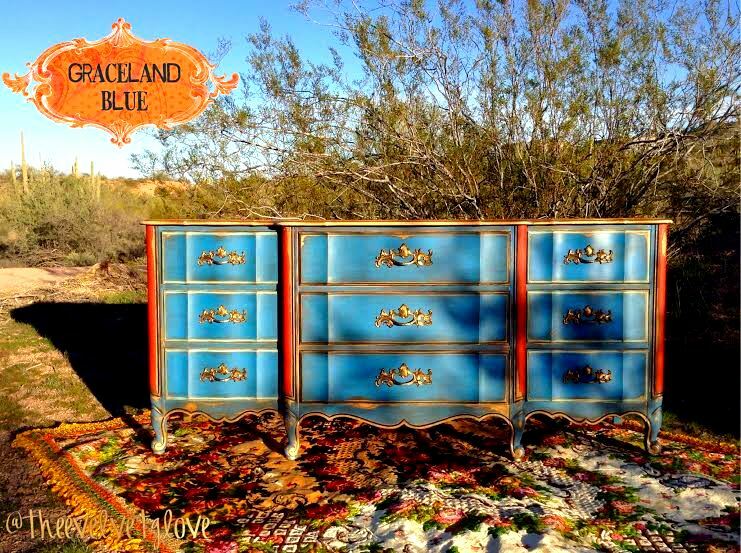 This is my latest piece in Graceland Blue. Lots of layers on this one. 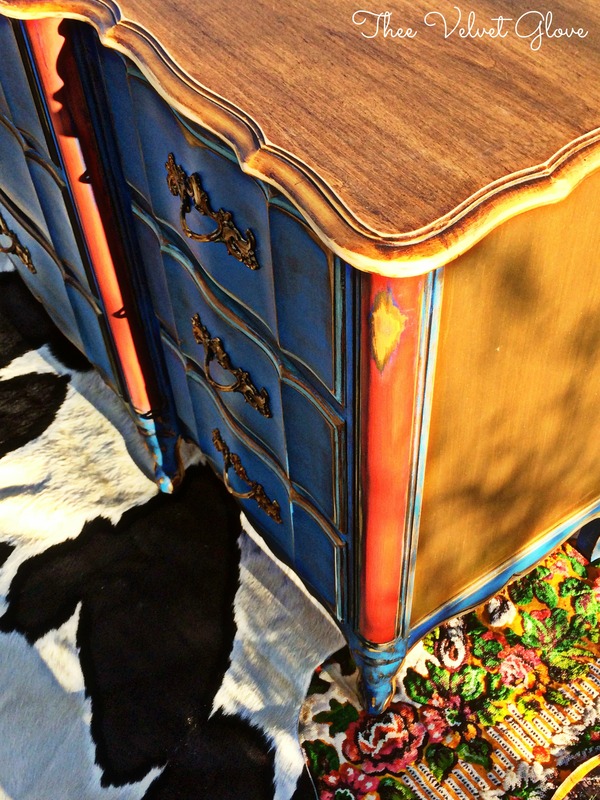 I started with gold, then added some Black Bean and Espresso Chalk Type Paint by Heirloom Traditions all over in random places for depth and because I knew I wanted this piece distressed to reveal several colors underneath. I trimmed with Daredevil Chalk Type Paint by Heirloom Traditions on the frame, Black Bean on the center drawers and Synergy on the outside drawers. For an aged look I used Vintiques Antiqued Brown Spray Wax (I don’t spray it directly on the piece. I pour it in a bowl, brush it on and use it that way.) with a bit of Ancient Agings Aging Powder around the outside edges of the drawers and frame and then a layer of Muddy Pond Soft Wax over the entire piece. Heavy distressing revealed the wood, black, brown and gold layers underneath. You can see below the progression of layers. Gold, Black Bean, Espresso, Graceland Blue then Graceland Blue with the finishing and aging products along with distressing. Enter the super ugly stage where if someone sees it they gasp and think I’ve lost my mind. If you paint furniture you know what I mean. 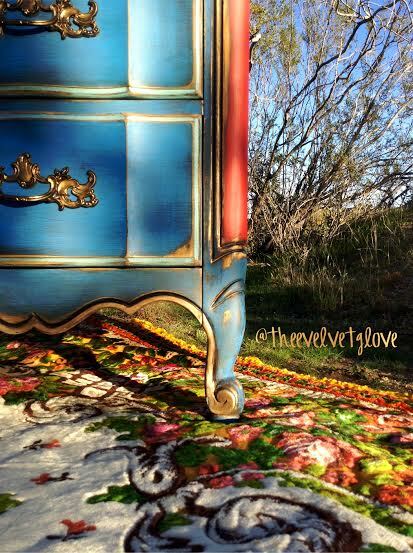 You can see below where I brushed on the Black Bean and Espresso Chalk Type Paint over the gold. 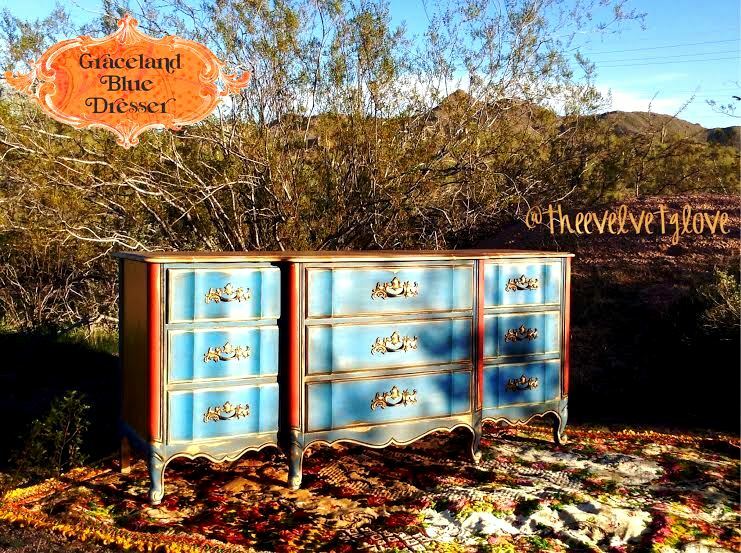 This entry was posted in Before and After, Chest of Drawers, Dresser and Mirror, Heirloom Traditions Chalk Type Paint, Uncategorized and tagged before and after, distressed, furniture, Graceland, Graceland Blue, Heirloom Traditions, heirloom traditions chalk type paint, waxed by theevelvetglove. Bookmark the permalink. Extraordinary piece, and an amazing new signature color! Your work stands apart, and it’s the loving attention to the process, the willingness to follow your heart and your magic hands that make it so. Kudos on another masterpiece! Wow, that’s really different. I can certainly appreciate the art of this piece. Well done!